George John Reimer: carpenter and choir director; born 23 January 1908 in Kaltan, Neu-Samara Mennonite Settlement, Russia, to Johann J. Reimer (1859-1922) and Helena (Eck) Reimer (1875-1951). George was the ninth of 11 children. 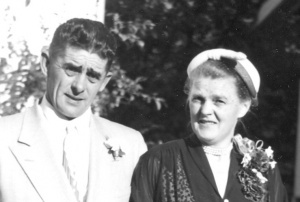 He married Lena Wiens 29 June 1930, the second couple to be married in the Yarrow Mennonite Brethren (MB) Church. The Reimers were blessed with seven children: Bill, Holda, Rudy, Johnny, Elfrieda, Robert and Irene, all born in Yarrow or Chilliwack. In 1926, George immigrated to Canada with his mother, youngest brother Peter and married sister Mariechen (Mary), together with her husband Peter. The family settled in Yarrow and worked hard to establish a home and the new immigrant community. In 1939, the Yarrow Mennonite Brethren Church called George to be the choir director, a position he loved and continued leading for 23 years, the last few years serving intermittently due to work away from home. George Reimer’s education consisted of basic elementary school in Russia and six months at Elim Bible School, in Yarrow. He was a self-taught musician, with an intense love for music, choral music in particular. He advocated and implemented innovative ways to bring new and fresh music and thought into the life of the church. In most of his endeavors he was well received because of his charismatic and vivacious personality. George had a natural tenor voice, which afforded him opportunities to sing in quartets, male choirs and often as soloist at weddings and funerals. He also sat on the church council for a number of years and used his forward thinking to help shape, and at times alter, some of the actions of the church leaders. Together with other conductors throughout the Fraser Valley, George helped organize Saengerfests (Music Festivals) for Mennonite church choirs in the lower mainland, bringing in guest conductors from Winnipeg, such as K. H. Neufeld and Ben Horch, as clinicians. It was during George's time as conductor that the Yarrow church purchased its first grand piano, a Steinway. This piano is still being used in 2009. Along with his musical contributions, George Reimer’s carpentry skills benefited the community. He helped in the building of the existing Yarrow MB Church. His expertise was also called on when an organ was introduced to the church and renovations were needed to accommodate the large speakers. He also contributed time and energy in building some cabins at Columbia Bible Camp (now Stillwood Camp and Conference Centre). George was not only the manager at the local fruit plant, but designed the building as well. Frequently George traveled throughout the province with his construction crew of which his was the superintendent, building grocery stores, gas stations, and office buildings. One of his last construction projects was the lodge at Rogers Pass. He took great pride in his work and was well loved on the job. George and Lena loved music and ensured that their children had every opportunity to experience good music. In summer, the parents would make the drive to Vancouver to hear Sunday afternoon symphonies in the park. Lena would pack a lunch for the frequent picnics after the concert. George's other love was sports, especially baseball and hockey. He would take his sons with their friends to hockey games in New Westminster. The music that filled the heart of George Reimer lives on today in the lives of his children and grandchildren, who continue the tradition of service and musical education in the church and community. His sudden death on 3 November 1963 shocked the community and left a huge void in the home and church. He is buried in Yarrow. Funk, Irene. "Reimer, George John (1908-1963)." Global Anabaptist Mennonite Encyclopedia Online. November 2009. Web. 21 Apr 2019. http://gameo.org/index.php?title=Reimer,_George_John_(1908-1963)&oldid=96184. Funk, Irene. (November 2009). Reimer, George John (1908-1963). Global Anabaptist Mennonite Encyclopedia Online. Retrieved 21 April 2019, from http://gameo.org/index.php?title=Reimer,_George_John_(1908-1963)&oldid=96184.